Enjoy up to 120,000 bonus Qantas or Altitude Points when you apply for the two-card bundle, are approved and meet the minimum spend of $3k for each card - Westpac Altitude Black Mastercard and the American Express Westpac Altitude Black Card. T&Cs apply. New cards only. Click here to apply. Offer ends 2nd June 2019. Find out more. 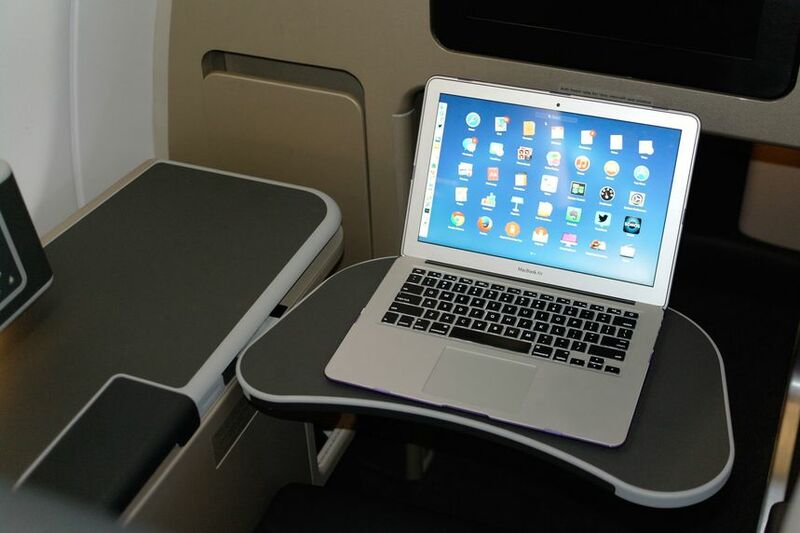 Domestic business travel takes a dramatic leap forward with the Qantas Business Suite. 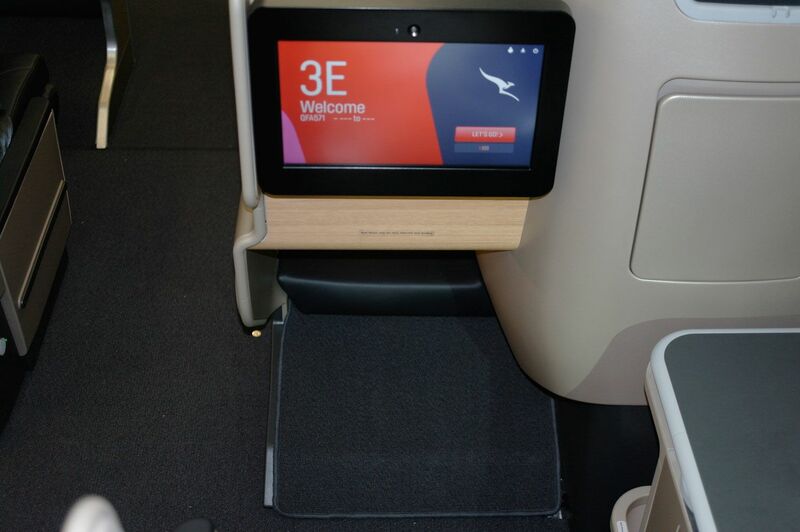 The flying kangaroo’s next-gen business class seat fulfils the wish list of Australian business travellers with everything from a fully lie flat bed and easy access to the aisle to plenty of working space and storage space to keep your carry-on kit close at hand instead of out of reach in the overhead bin. 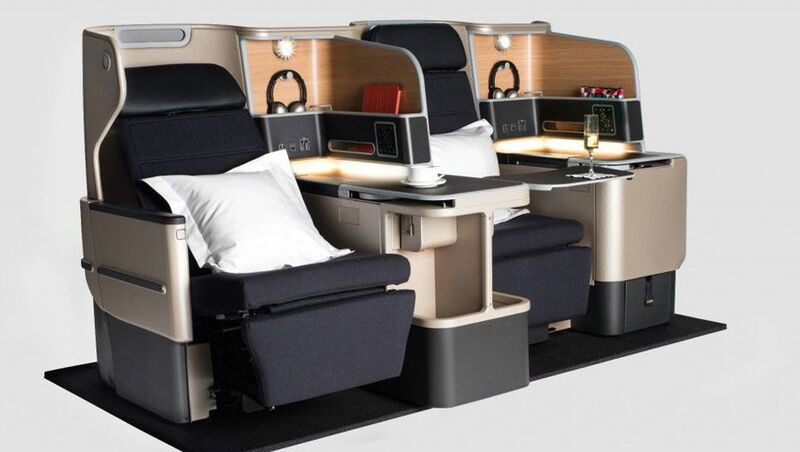 The Business Suite will most often fly on the transcontinental routes of Sydney-Perth, Melbourne-Perth and Brisbane-Perth, although it’ll also appear on shorter ‘triangle’ legs of Sydney-Melbourne and Sydney-Brisbane as Qantas works to make the most of its twin-aisle Airbus A330s. 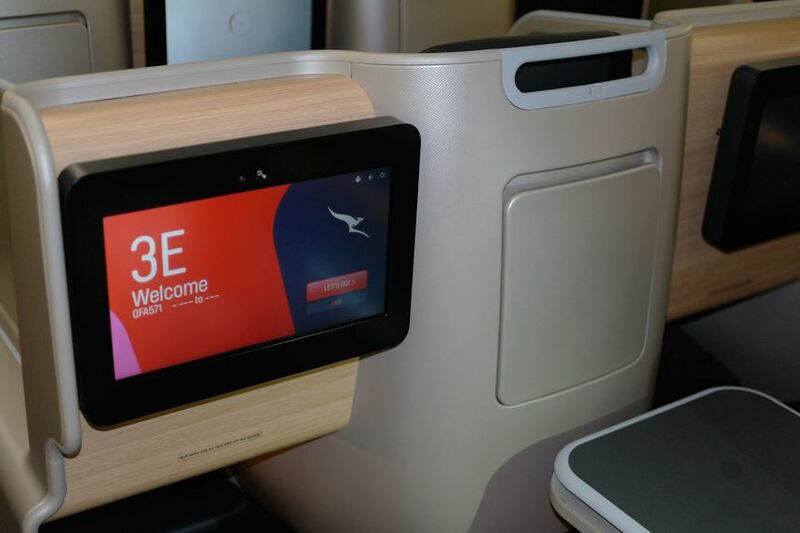 Australian Business Traveller flew on the very first A330 Business Suite service between Sydney and Perth to bring you this detailed review. Don’t want to read all the way through to the end? Here's the take-out: the Qantas Business Suite is the world’s best domestic business class. Yes, it's that good. 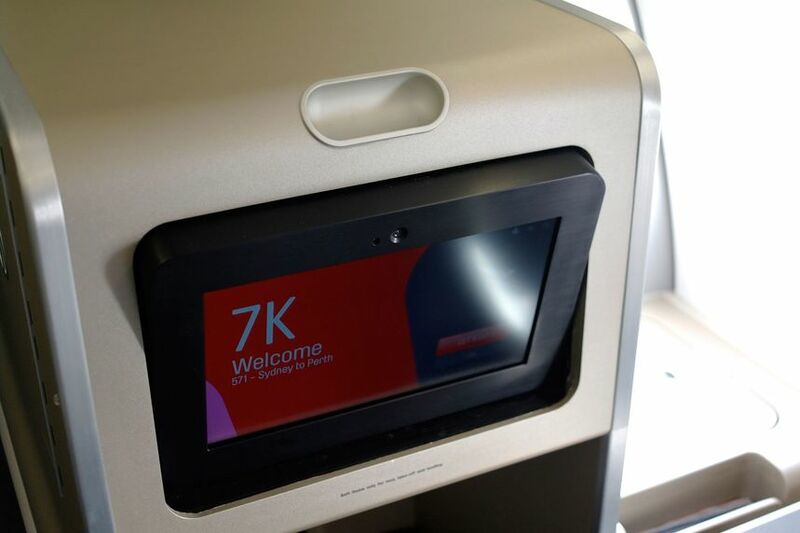 We flew on the first Qantas Airbus A330-200 that's been upgraded with the new Business Suite – it also sports a 'refreshed' economy cabin with new seat fabrics plus an updated inflight entertainment system. 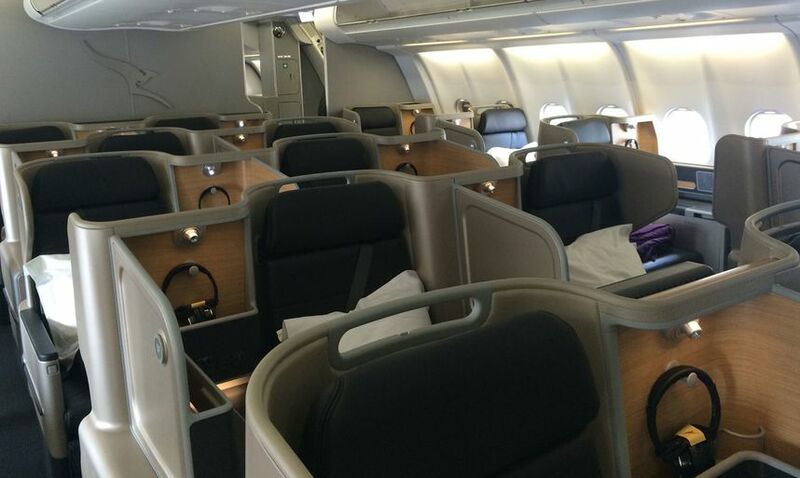 There are 28 Business Suites at the A330's pointy end, down from the 36 business class seats in the previous domestic layout, with the space divided into a main cabin of 22 seats at the very front of the plane, and a second smaller cabin (sitting immediately ahead of economy) of six seats. ... and a pair of seats in the middle of the aircraft. 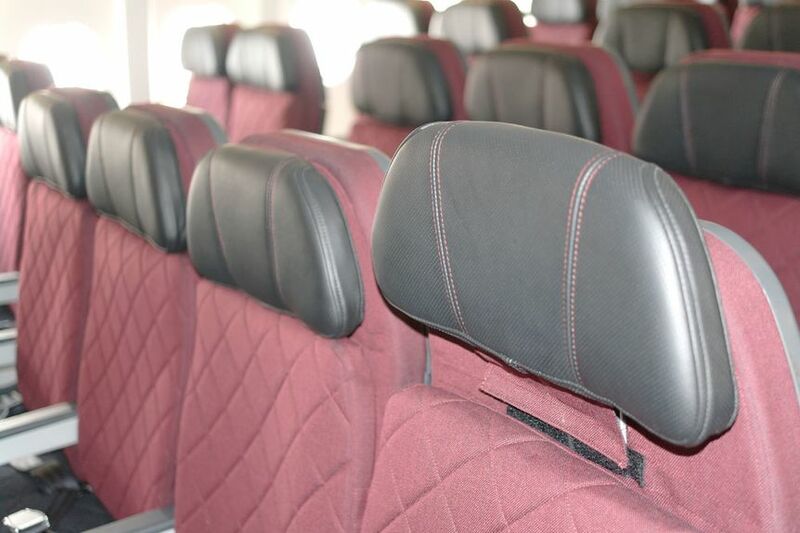 Note that the partitions between the paired middle seats don't slide down – they're an integral part of the seat's design – which makes the Business Suite less than ideal if you want to chat away to your partner during the flight. 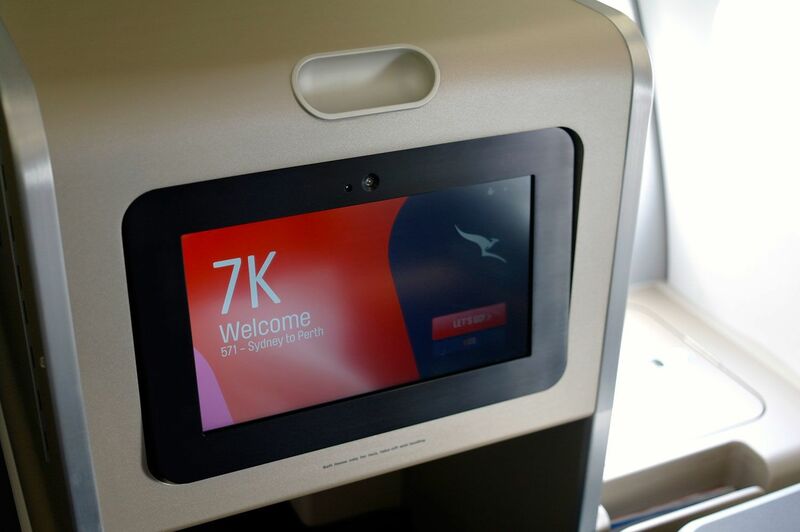 The Qantas Business Suite has all the hallmarks of the world's best and most modern international business class seats. For starters, the 1-2-1 layout provides one-step access to the aisle – and that step doesn't involve squeezing past or clambering over your seatmate, as is the case with Qantas' current Airbus A330 or A380 business class (both of which are 2-2-2). 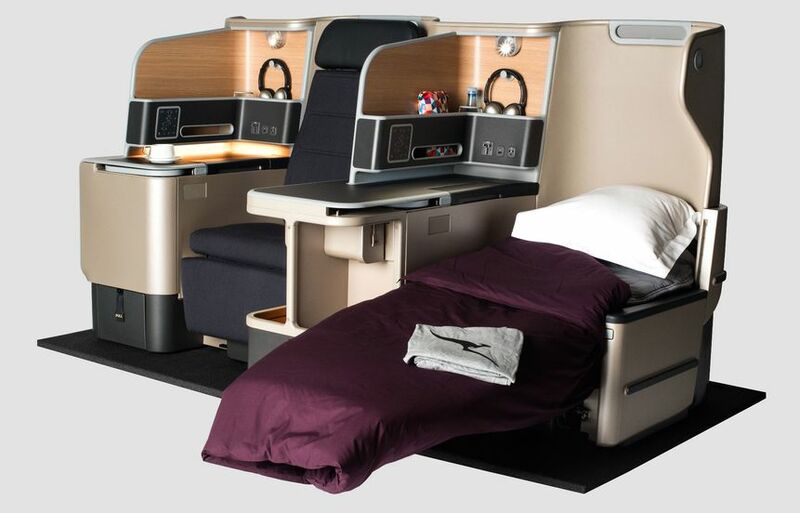 Another game-changer: the Business Suite converts to a 2 metre long lie-flat bed (shown in this PR shot dressed with Qantas' sleep service mattress and cover). 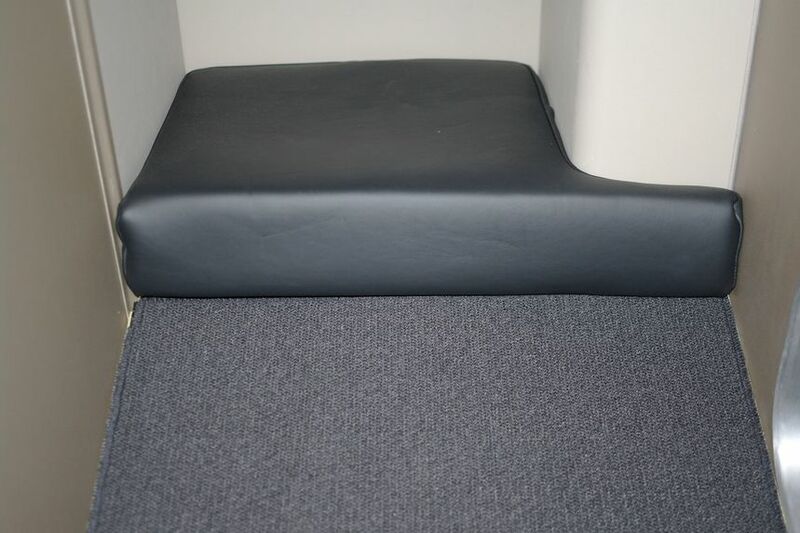 This is Australia's first fully-flat domestic business class bed and it's going to be a Godsend on overnight 'red-eye' flights from Perth, even though you've only got a few hours of kip time. 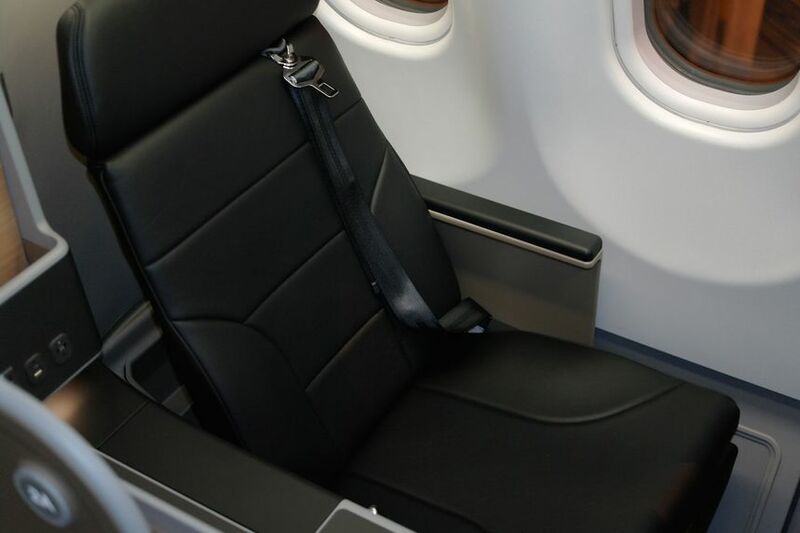 To help bleary-eyed business travellers make every minute count in their quest for sleep the Business Suite is also approved for a gentle recline during the taxi, take-off and landing stages. 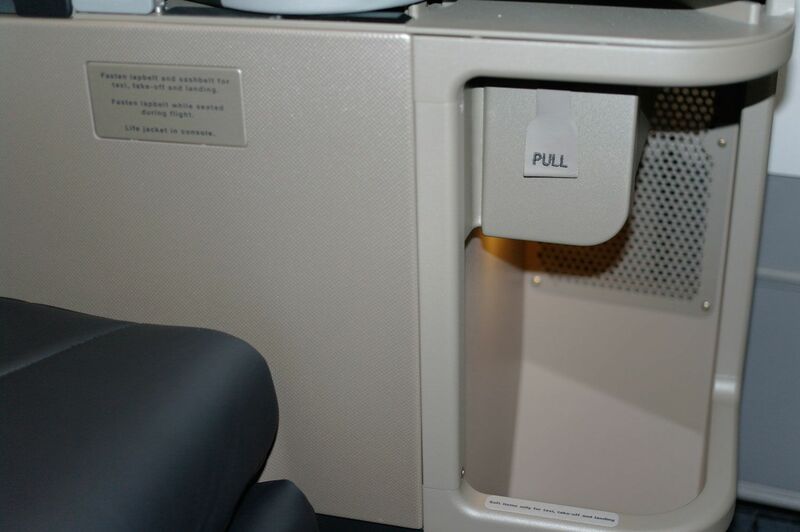 Instead of sitting bolt upright until the plane is in level flight the Business Suite's 'relax and recline' setting allows the seat to tilt back on a 5 inch recline (equivalent to 21 degrees) and slide forward into an approximation of what you'd typically enjoy during the flight, except that the legrest can't be raised in this mode. Here's how this position looks on demo models of the seats. When you think about how long your soon-to-depart plane can sit at the boarding gate, or how often it slowly crawls along the taxi-way only to join a line of other aircraft waiting their turn for take-off, that's all time you can spend in a relaxed and snooze-friendly position. This reclined position necessitates the use of a three-point seatbelt for maximum safety. 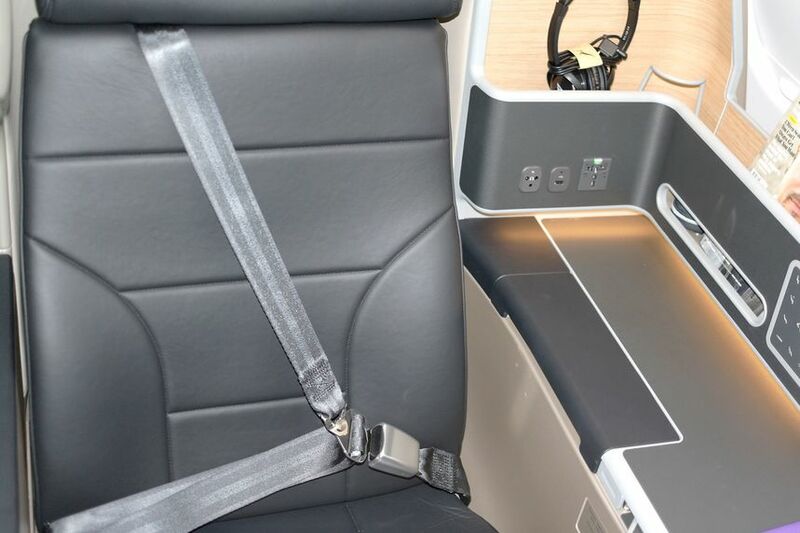 Qantas is among the very few airlines in the world to engineer a business class seat in this way – Air New Zealand and Virgin Atlantic have something similar, but the Business Suite has a greater degree of recline. Of course, during the level flight stage of your journey you can hit a button on the control panel to bring out the legrest or convert the seat to a fully flat bed. The seats themselves are covered in leather and range from 55cm to 58cm wide (depending on the location of the seat – more on that later). 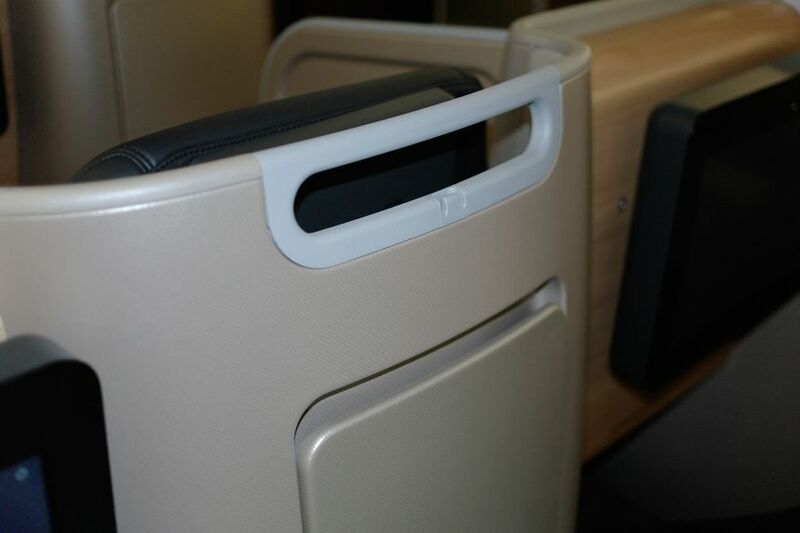 On some seats the armrest retracts to effectively add an extra 5cm to the total seat width, so you don't feel quite as 'hemmed in' by the sidewall. 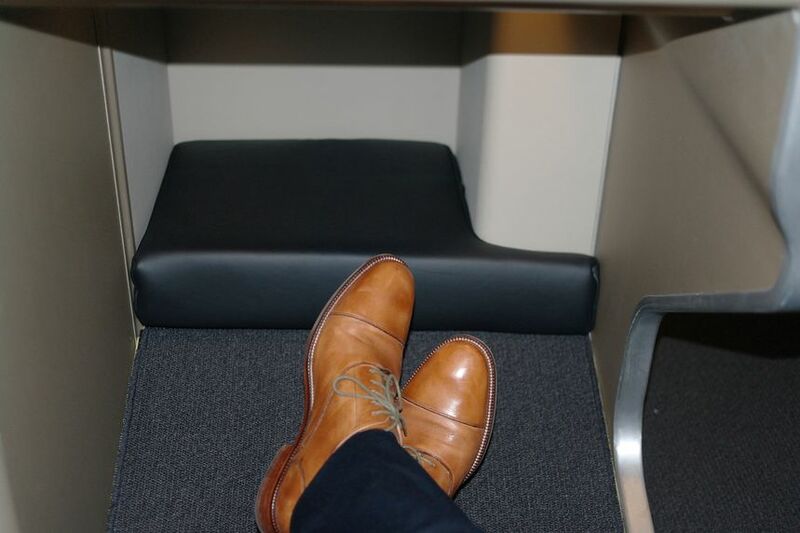 Not all seats get the vanishing armrest, however – only those with an armrest facing the aisle can do this trick, which is roughly half of all 28 Business Suites on the A330. Want to make sure you get a solid serve of shut-eye? 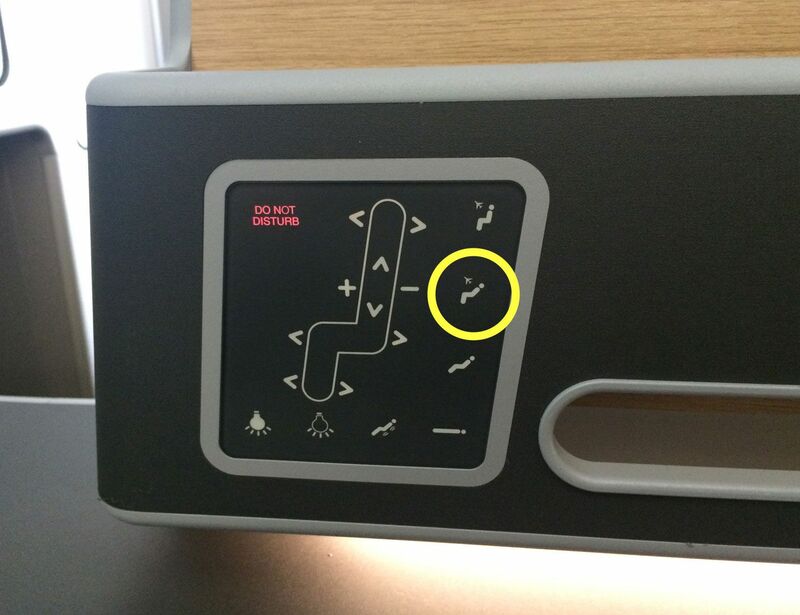 Hit the 'Do Not Disturb' button on the seat's control panel and the seat number glows red so that flight attendants know to leave you alone. 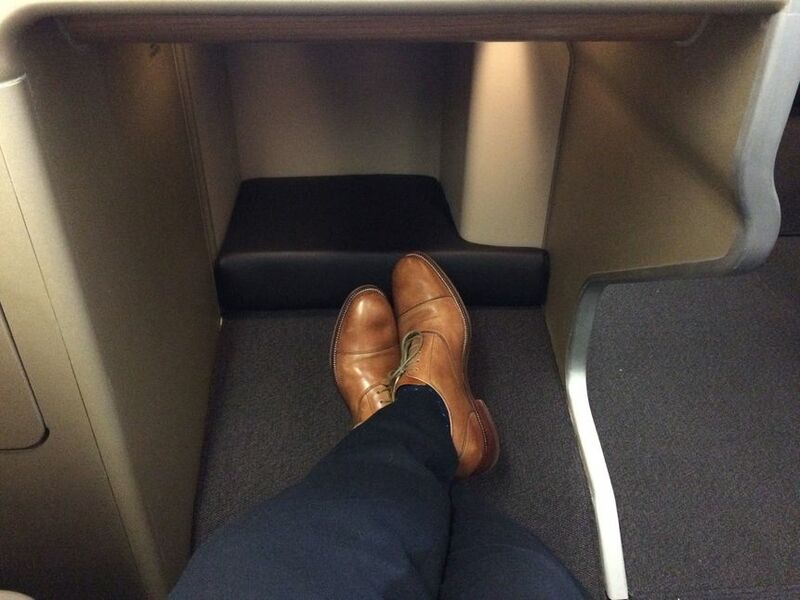 There's plenty of legroom, even for the tallest and most gangly-limbed traveller. 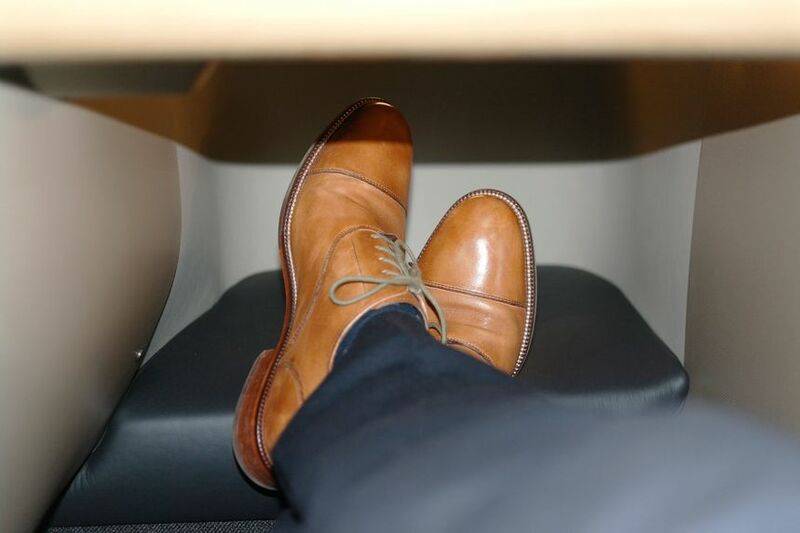 The generous footwell ends in a small cushioned ottoman, while the floor of the footwell is angled so that it becomes a comfortable footrest once you stretch your legs a little. But the very first thing anybody will notice about the Business Suite is the copious amount of personal space it provides. Every passenger has their own side table created by a console next to the seat. This puts some 30cm of flat surface at your disposal – and if you're in a middle seat with nobody next to you, you can annexe some of that vacant space to claim a further 10cm. That's ample room for magazines, tablets, ebook readers, work-related documents and what-not. Running along the inner edge of this console is a deep L-shaped nook for stowing more stuff. As a result, there's a riot of space to keep carry-on kit at your fingertips. The recess also holds a crisp LED reading light with two brightness settings, a pair of noise-reducing headphones plus a small water bottle holder, while on the outside are sockets for the headphones, USB and AC power. Got more gear that needs to find a home close at hand? 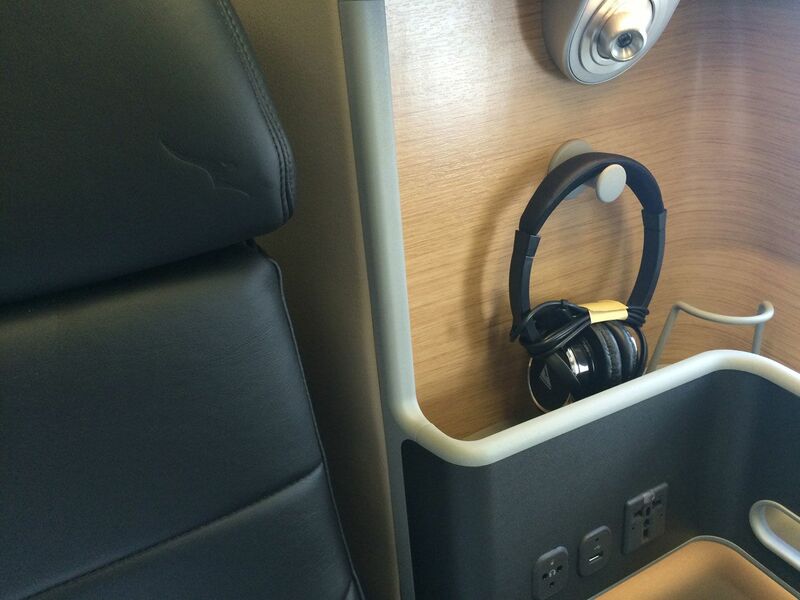 ... while under the console there's a deep pocket for your shoes or an amenity kit. 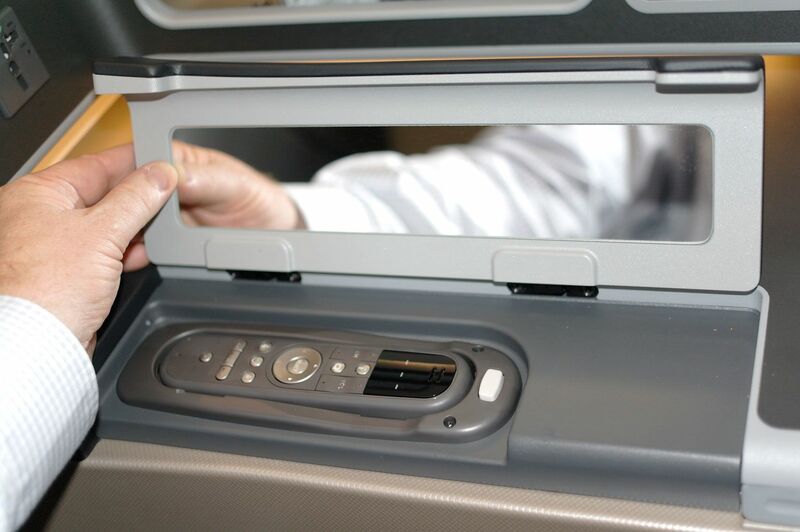 The overall effect is that as soon as you reach your seat there's room for you to offload whatever personal items you wish to keep close at hand – such as your smartphone, tablet, reading glasses, a magazine or book. This isn't sparked by purely the amount of space provided. It's the visibility of this, and the variety in the shape of those spaces and their proximity to you, which invites you to park your gear there and intuitively guides you as to what should go where. That's a trademark of smart, considered and well-informed design. There are also several small yet thoughtful touches in the mix. 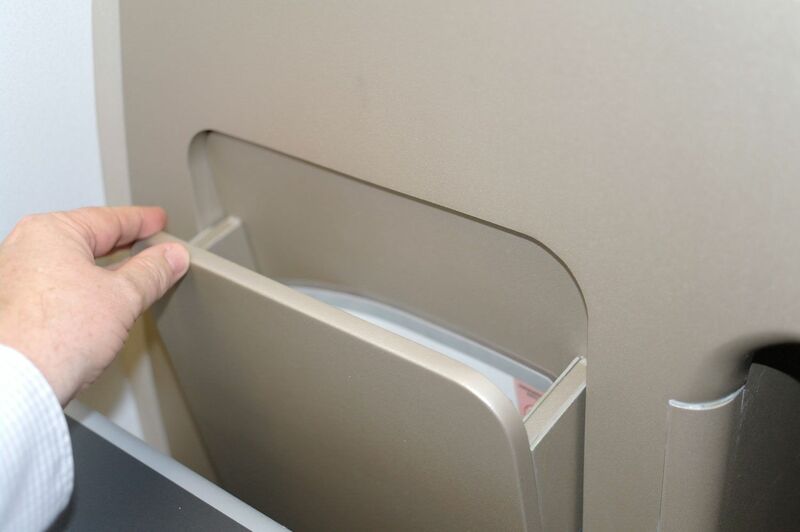 A mirror concealed inside the lid to the remote control makes it easy to touch up your make-up or do your hair before landing without having to queue for the loo. A soft LED lighting strip built into the underside of the console's shelving provides gentle illumination around the workspace. 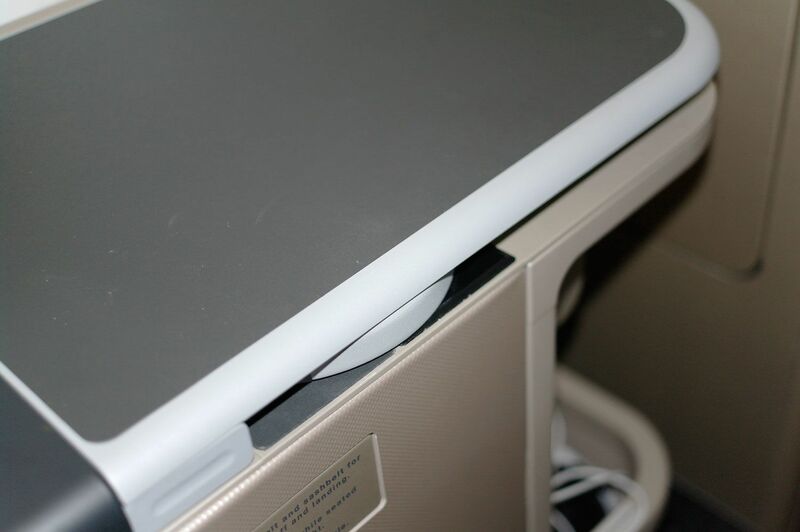 A cut-out slot in the shelf helps you spy any small items which you might otherwise overlook and leave behind. ... while the rest have a small plastic cut-out which serves the same purpose. As you can see, there's plenty of goodness on tap. However, the unique staggered layout of the A330's business class cabin means that not all Business Suites are the same – while some are potentially more comfortable than their siblings. Here's why, and what it means to you when you're selecting your seat. The same applies to the Business Suites in the middle of the plane. Each row has one passenger sitting immediately next to the aisle, and one passenger with the seat's console between them and the aisle. Again, the layout swaps between rows. This alternating arrangement is necessary because under each seat's console is the footwell for the seat behind it. ... and when the seat is converted into a flat bed. I've got average-sized feet which slip into an 8.0 to 8.5 shoe (that's Aussie sizing – equivalent to a European 42-43 or US 9.0 to 9.5). They sat well inside this cubbyhole, and no doubt would have a little more wiggle-room once I shed the shoes for sleeping. 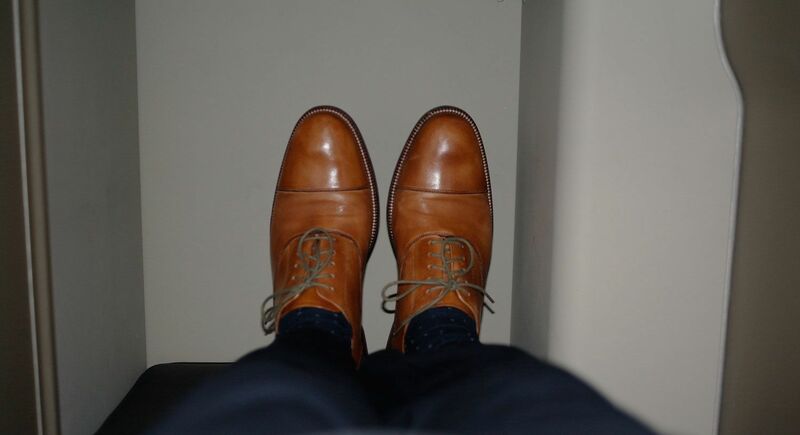 But for passengers with much larger feet – say, size 10 and up – this is going to be a tight squeeze. My tip is to book any of the seats facing the bulhead wall (rows 1 and 7), which don't need to neatly dovetail into a seat in front because there is no seat in front. 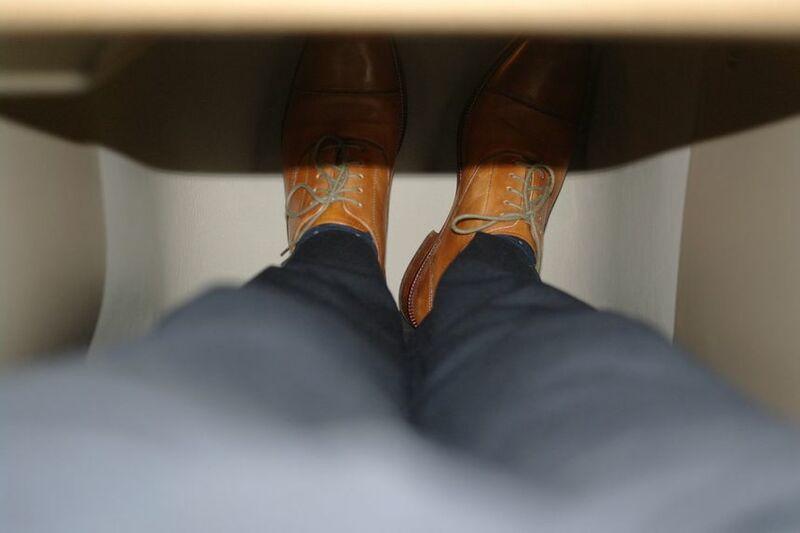 As a result, the footwell goes from being a cubbyhole to a cavern with a generously high ceiling. 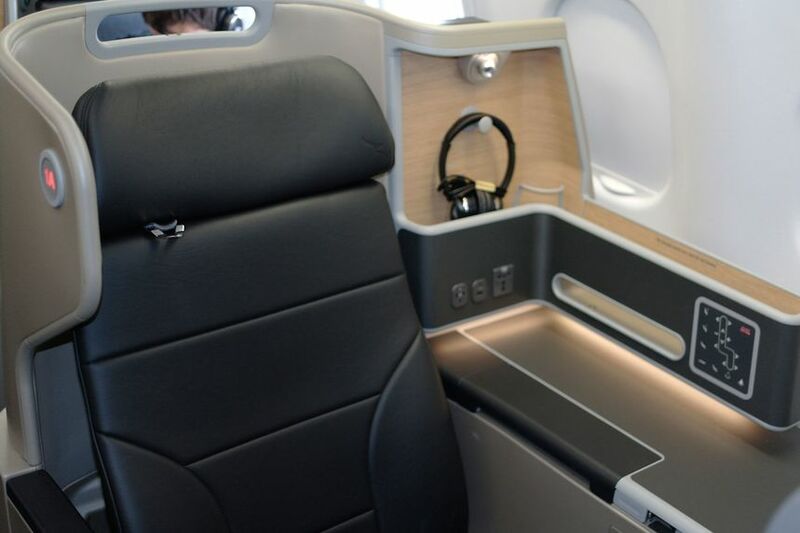 The next point of difference between the Business Suites is the width of the seat, both in the actual seat cushion and whether or not the armrest slides down to give you a little more elbow room. 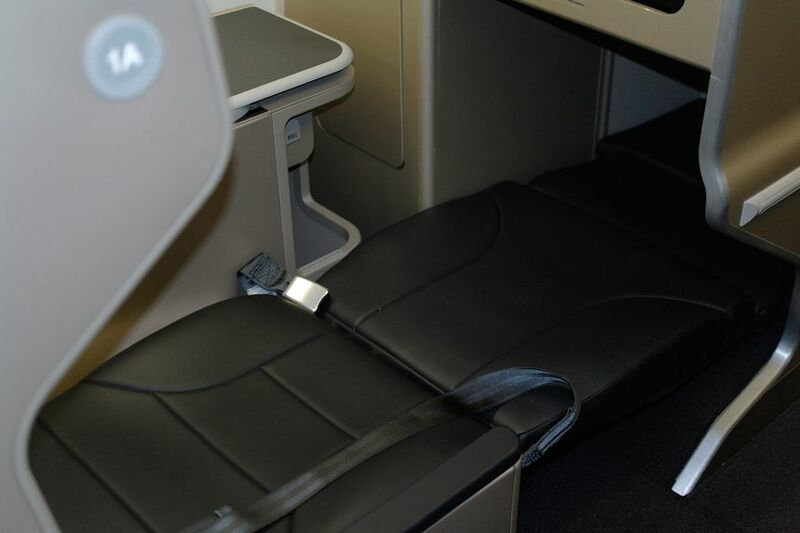 Business Suites which have the passenger sitting directly at the aisle have a 58cm (23in) seat width, with another 5cm (2in) once the armrest is pushed down into the seat's shell. 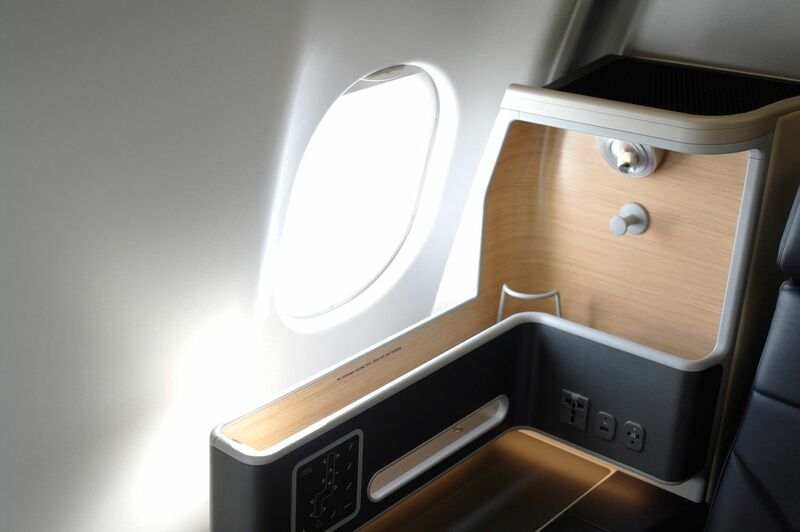 Business Suites with the passener next to the window and the console next to the aisle (as shown below) have the same 58cm (23in) seat width but the armrest is fixed in place. 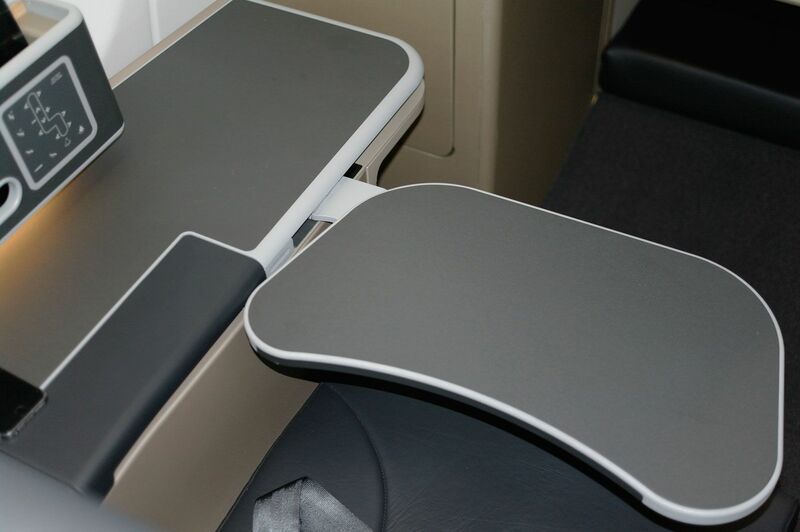 However, the equivalent seat in the middle pair of Business Suites – the seat where the passenger has the console between them and the aisle – has a slightly wider 61cm (24in) seat. 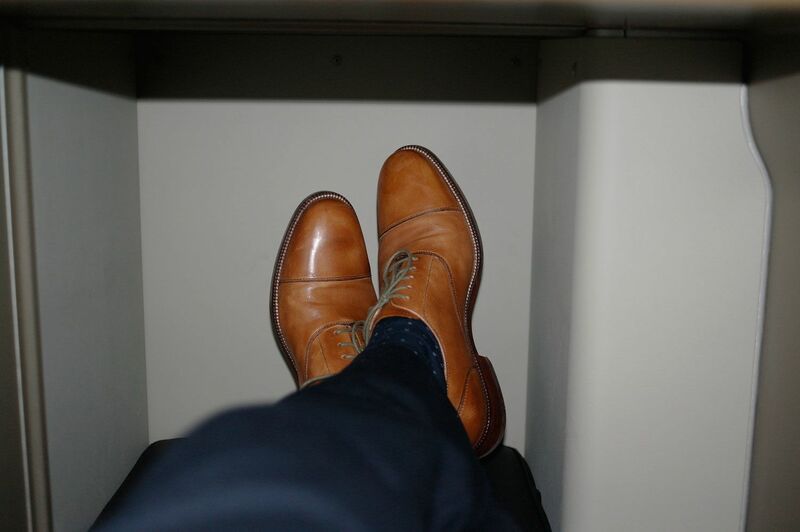 A final obervation on the relative comfort factor of each Business Suite: if the seat's bench is between you and the aisle, the gap between the front of that bench and the rear of the seat sell in front is only 26cm. That's the space you'll have to navigate every time you step in and out of your seat (to visit the toilet, for example). It's sufficient if you're of an average build, but 'plus-size' passengers will want to book the seats which let them step straight into the aisle without squeeing past the console. 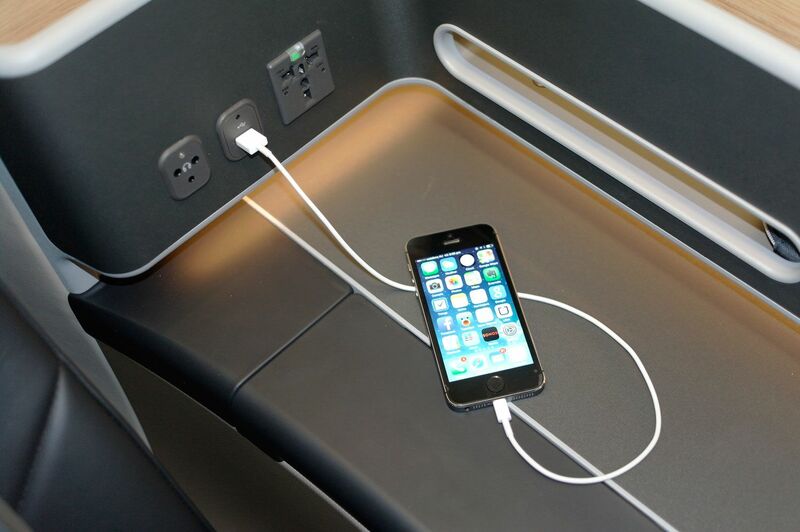 AC and USB ports for each Business Suite are conveniently located at shoulder-height in the console rather than near floor level between the seats, so there's no clumsy fumbling around in order to charge your laptop, tablet or smartphone. It's also a doddle to park your tech on the bench or in the recess while it's being juiced up. 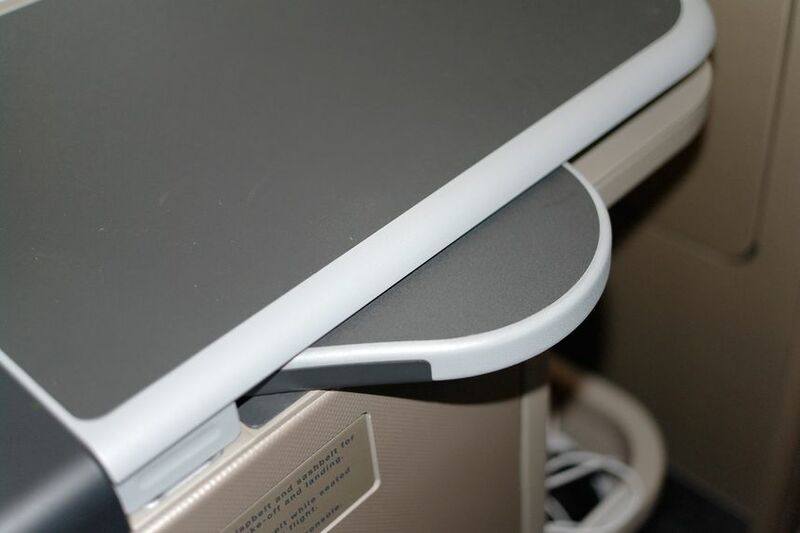 The over-sized tray table has ample room for your laptop. It's solidly constructed and firmly anchored to the console, but exhibits none of the bothersome 'bounce' of many large tables when you load them up with a laptop and start hammering away at the keyboard. As the Business Suite's debut was a standard commercial flight (QF571) which left Sydney at 5.30pm I was offered a three-course dinner service of a 'small plate' entree, a 'main plate' and desserts. So while this is primarily a review of the Business Suite itself, here are some notes and photos of the meal. From the two small plate options I chose a trio of tiger prawns on a bed of sesame soy Asian coleslaw, which proved to be a tasty and sharp starter. Sadly, the obligatory salad turned out to be just a handful of lonely lettuce leaves. Halved cherry tomatoes, some grated carrots and perhaps corn would go a long way to making this simple dish more rounded and more enjoyable. For mains I ordered the pork and veal meatballs, served with a tomato ragout, oregano and herbed risoni (a very short-cut pasta shaped like large grains of rice), matched to a Victorian Heathcote Estate 2013 Shiraz. This one really hit the mark: robustly flavoured without being too heavy. Fortunately there was room left for dessert: a warm banana and salted caramel cake with double cream, partnered to a sweet Lillypilly Noble Blend dessert wine. 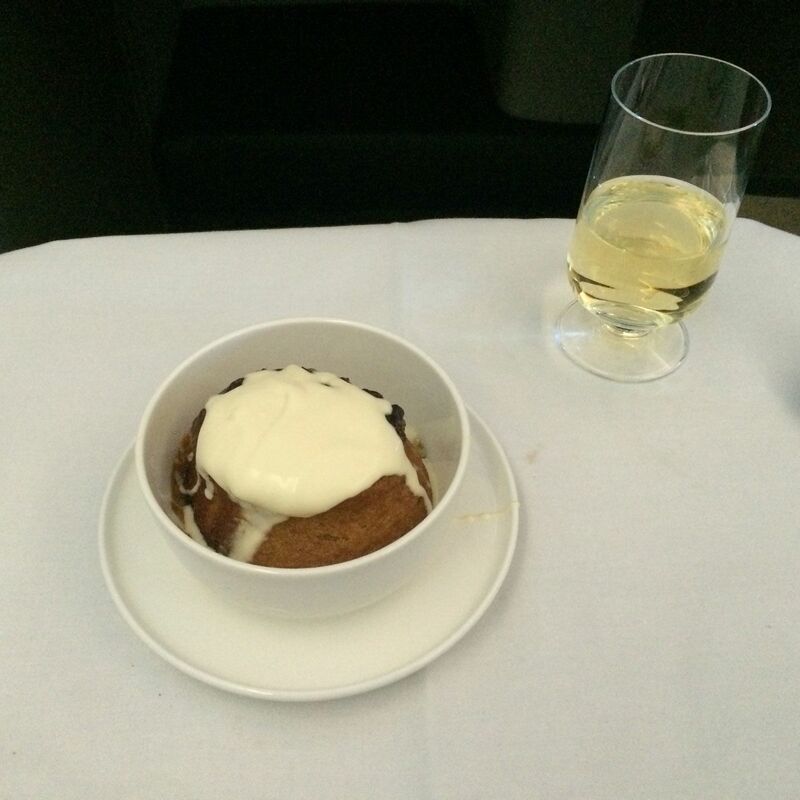 Putting the sad salad aside, the business class dinner was exactly what I'd expect from in a good mid-range restaurant or brasserie – except that I was flying 40,000 feet above the Australian outback. And thanks to the large side table, you can easily watch a video on your iPad while enjoying the meal. While we're talking meals, the Business Suite's dinner tray is among the largest I've seen – although a determined stab of the release mechanism is needed to spring it open. This kidney-shaped table is 53cm across at widest point, and 26cm deep, with a wide range of forward-and-back movement to find best position if you're eating or working. 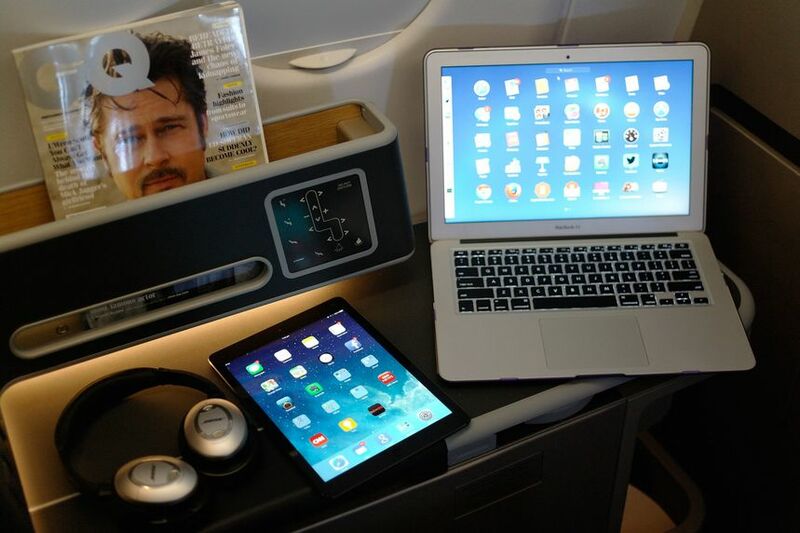 Each Business Suite gets a supersized 16 inch touchscreen with a slick new interface. The look and feel is derived from the modern mobile world of tablets, apps and tiles. The screens themselves are far more response to taps and swipes than earlier models, although a more conventional handheld controller under the armrest does the job if you've got short arms or have put the seat into lie-flat bed more. Some handy features in the new system include a pop-up flight information window (just tap the airplane icon at the bottom of the screen). This sensibly pauses any video being played. You can also browse the library of content and add specific films, TV shows and albums to a playlist. However, on this domestic flight the screen didn't include the food and drinks menu which will appear on the international A330s. The content itself is similar to what you'd get on Qantas' flagship Airbus A380s, although there's less of it because of the shorter flight time. 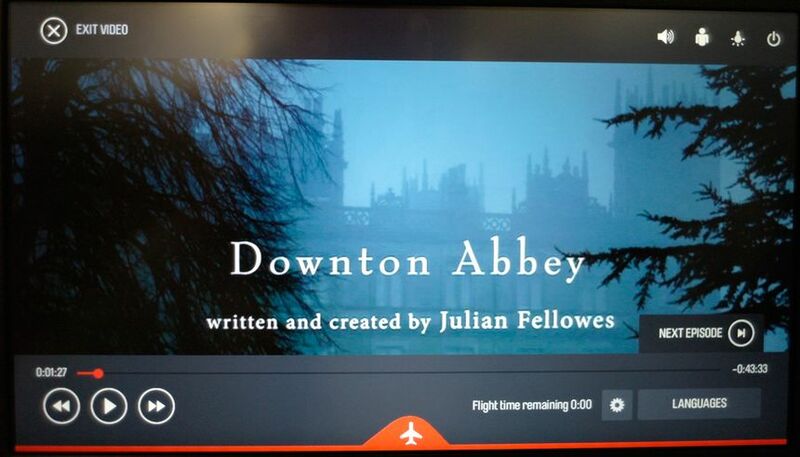 Even so, a Sydney-Perth trip is sufficient to knock over a movie or some recent episodes from Suits or Downton Abbey. There's also some clever thinking behind the scenes, or perhaps we should say behind the screens. 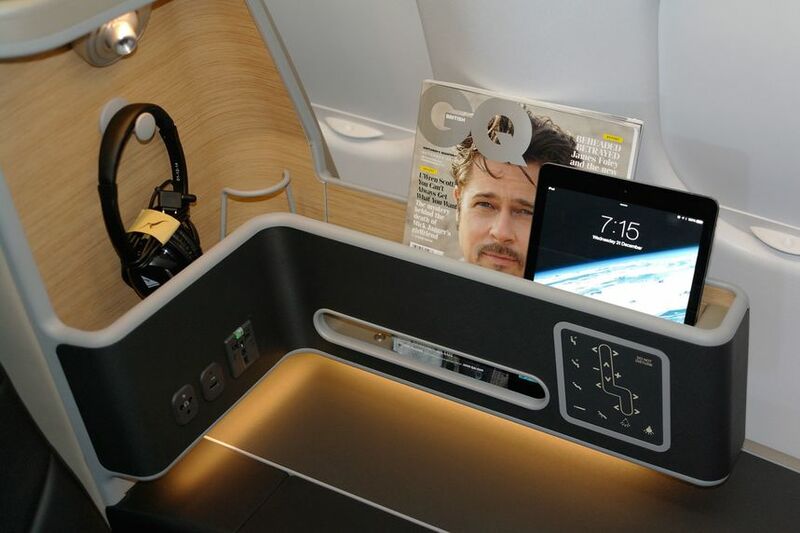 Copies of popular latest-release shows will be stored on a flash memory drive mounted behind the display so even if the connection from the screen back to the plane's media box (which holds all the videos and music) fails, you'll still be able to watch a few movies. Each screen also has a degree of tilt so you can angle it up or down to suit your height and seating position. There's less upwards tilt than downwards, so passengers close to 1.8 metres (6 feet) or taller will unavoidably find themselves staring down at the screen unless they do some serious reclining or slouching. 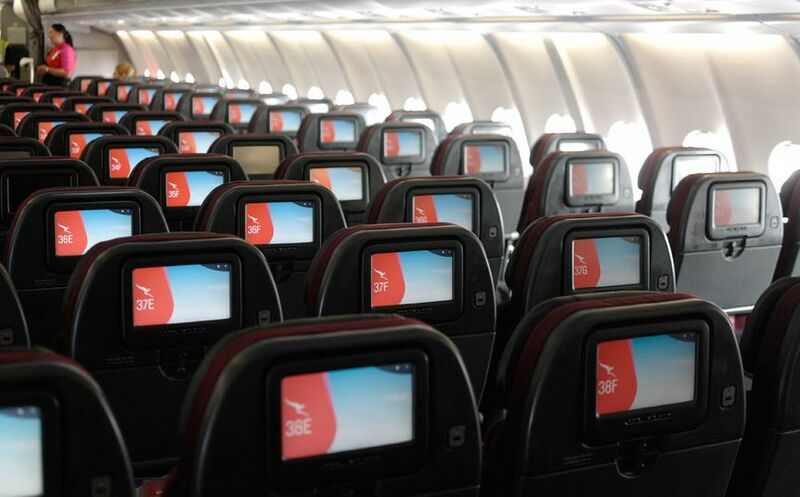 The upgraded A330s are also fitted with Qantas' Q Streaming technology, which can beam any of the inflight system's video or music content over Wi-Fi to a traveller's smartphone or tablet. 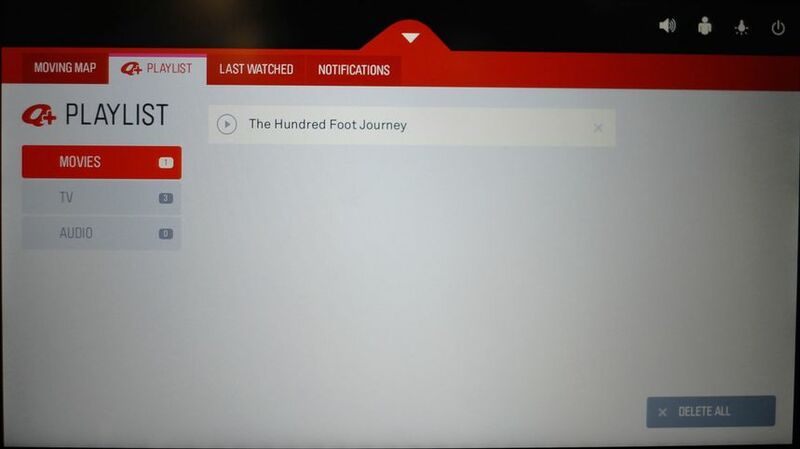 The Q Streaming feature hadn't been activated on this flight, however, so I was unable to test it. Although it's fairly common to see business class passengers travelling with their own noise-cancelling headphones (the Bose QuietComfort series always make a strong showing on any business class flight I'm on), Qantas outfits each Business Suite with a pair of noise-reducing headphones. I found these to be quite effective, as well as very lightweight and comfortable. 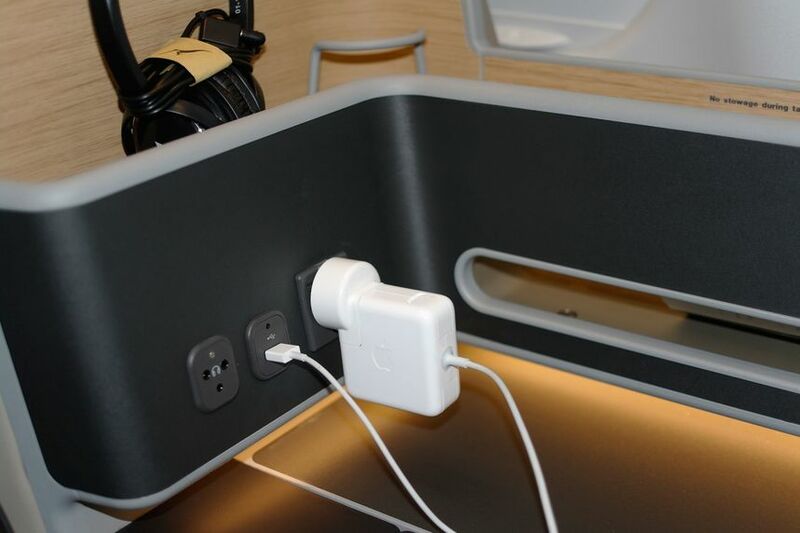 They also have a novel audio connector designed to plug into a standard audio jack – the kind found on smartphones, tablets, laptops, MP3 music players and such – as well as the two-pin socket for using the inflight entertainment system. 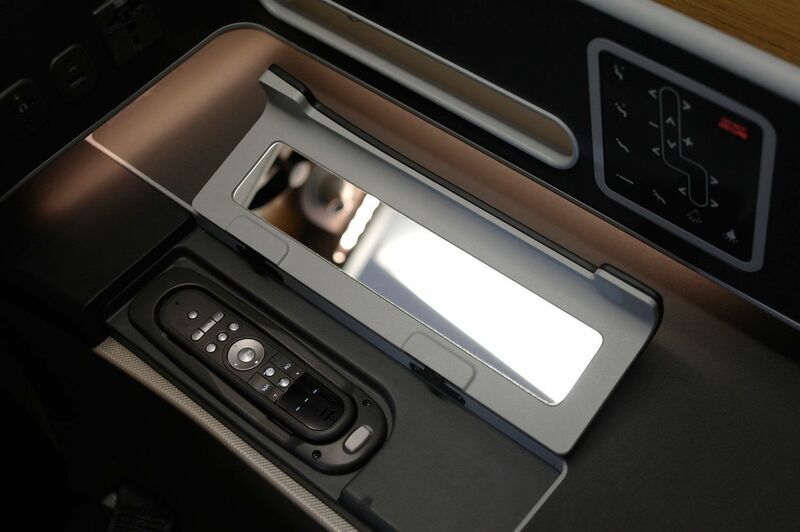 The audio connector itself is conveniently located on the side console, near shoulder-height to the passenger and alongside the USB and AC ports. 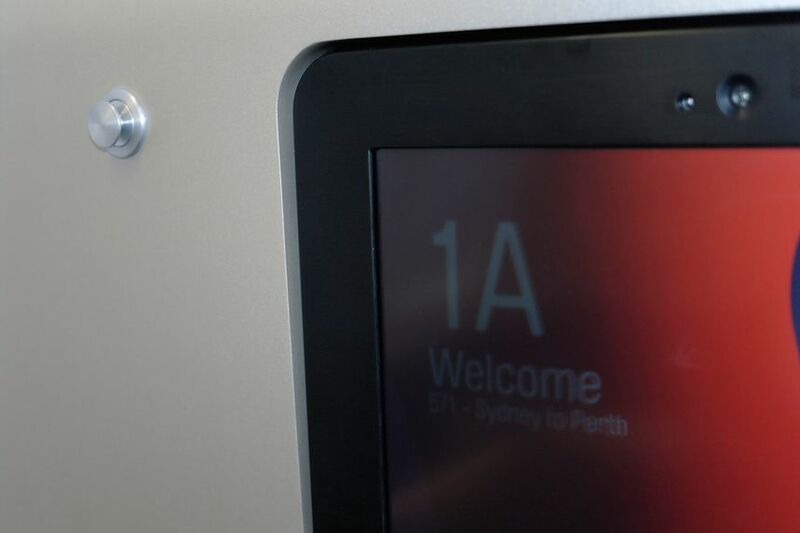 Over the past few years Qantas has been steadily ticking off the boxes on the Australian business traveller checklist with improved business lounges and inflight meals, and at the same time pencilling in new boxes such as its smartcard-based 'tap and go' Faster Smarter Check-in. The Business Suite is the latest and perhaps most important part of the mix. 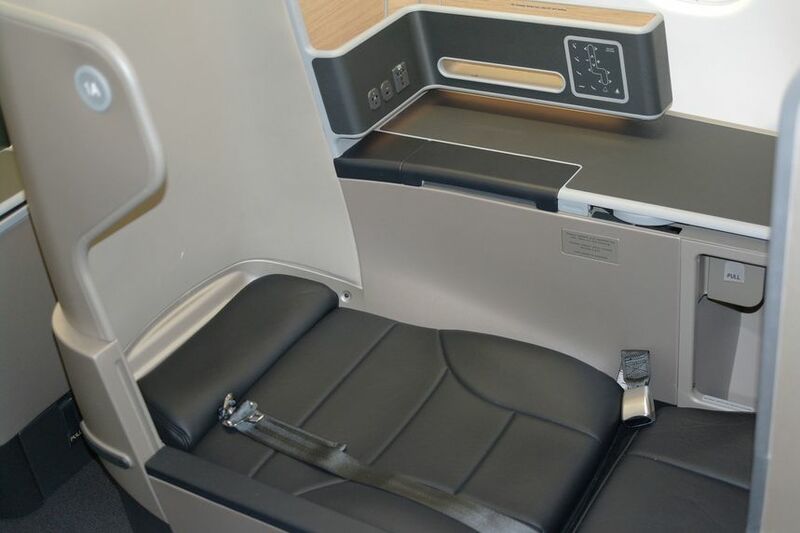 It raises traveller's expectations as to just how good the domestic business class experience can be (read: very, very good), and despite a few wrinkles, as we zoom into 2015 it easily takes the crown as the best domestic business class seat in the world. 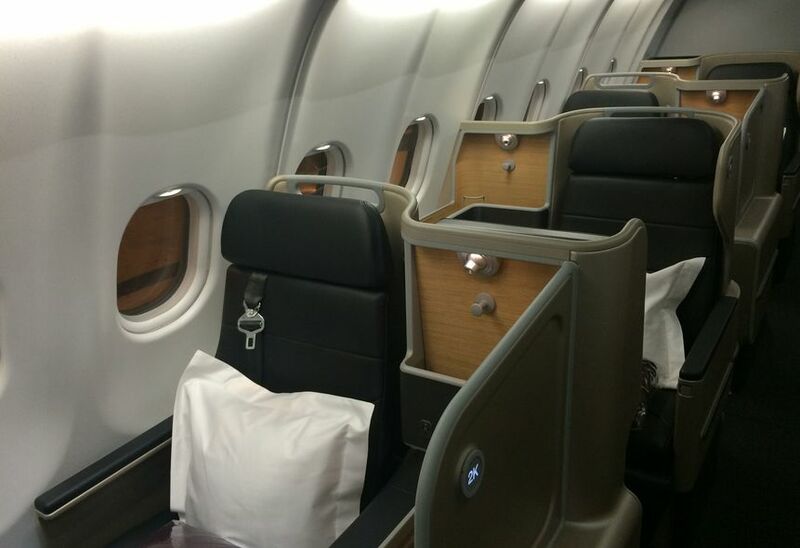 David Flynn travelled on the inaugural Qantas Airbus A330 Business Suite flight as a guest of Qantas. Looks amazing! Can't wait to fly on it. At least I know which seats to choose now! I found it a good hard product, finally matching (and exceeding finally) the VA transcon product. What was an epic failure for my flight was the attrocious service I received on board. I was dipping my toe back in the water with my flight. 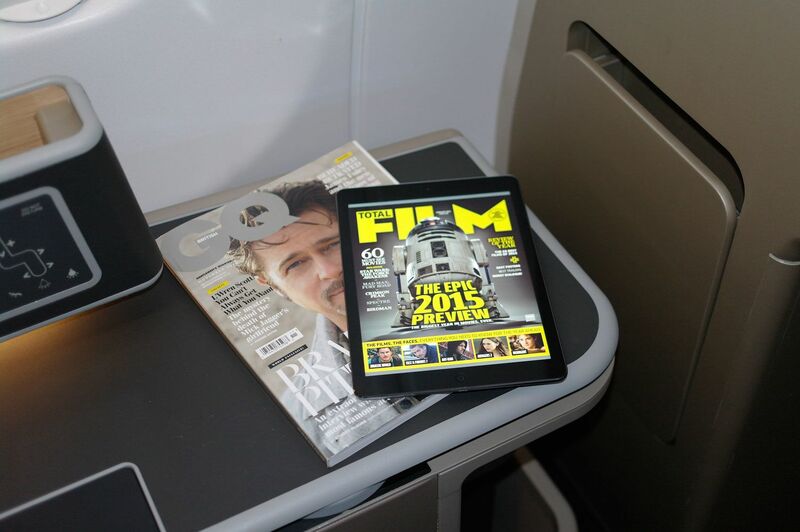 It will likely be quite some time before I make another foray into the QF business cabin at their fares. Didn't receive choice of meal for entree or main, they had not loaded champagne, and the crew member "caring for me" clearly didn't care. Quite a shame because the cabin certainly looks the part. Fortunately I spent most of my time engrossed in the entertainment to distract me. The fares are now crazy, QF $1,929 each way and Virgin $1,879 each way..... It has been a little while since doing the flight home to Perth from Sydney but I remember only paying about $1,350 for QF the last time I used them (probably about 2-3 years ago now). During the last couple of years I had been using Virgin because the product was better and the price was as low as $999 each way with the maximum I can remember being about $1,300. How is $4,000 return justified, I could get to Europe on one of the less reputable airlines in Business class for only a fraction more than that. Or if I went Vietnam Airlines to Europe it would be cheaper!! 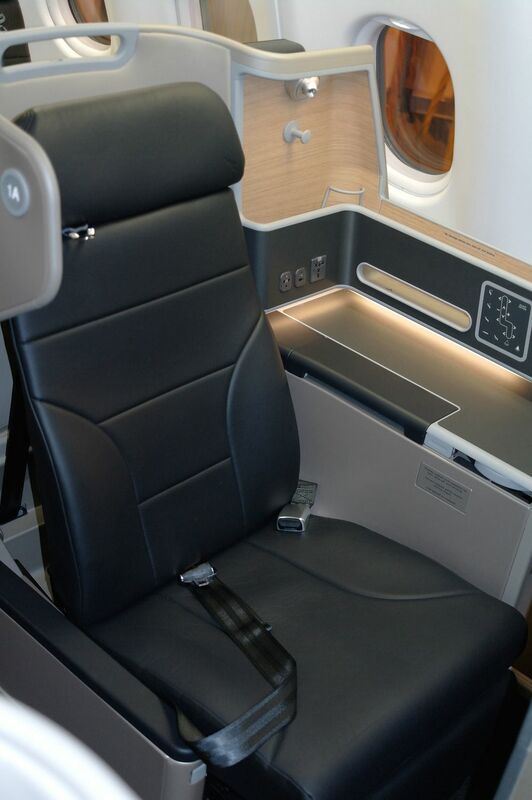 Yes, MEL-PER has gotten a bit crazy pricing wise for Business Class. One benefit of being a VA Velocity Platinum is I can guarantee a confirmed upgrade from Flexible Economy (which isn't so crazily priced) using my complimentary upgrade e-vouchers, well ahead of actual travel (indeed it's the only flights I use these free upgrade benefits for - it's rare that I need to visit Perth more than twice a year). While, as a Qantas FF Platinum I can get priority for points upgrades on MEL-PER, it's not confirmed until days before travel so it's not as good for me. And I'd rather use the points for something better. That must be nice. Congratulations. David, your coverage on this has been second to none. It looks fantastic! I think this will do well on the Asian routes as well. The over the shoulder part of the belt only needs to be used for take-off and landing. It can be detached from the lap part of the belt once in flight. Thus gives the benefit of both safety and comfort. Any chance of Qantas giving us one on the BNE-DRW route now that our beloved 767 has retired from service. Thanks David, we have been hanging for your review and it doesn't disappoint. A few supplementary questions - What is the economy refresh looking like? Have the toilets been upgraded as well? Didn't notice if the business class loos had been changed in any way. That looks astonishing, far better than the current A330-300 Economy. Keep in mind that the newer -200s delivered with seatback IFE (as shown above) have just undergone a cover change. 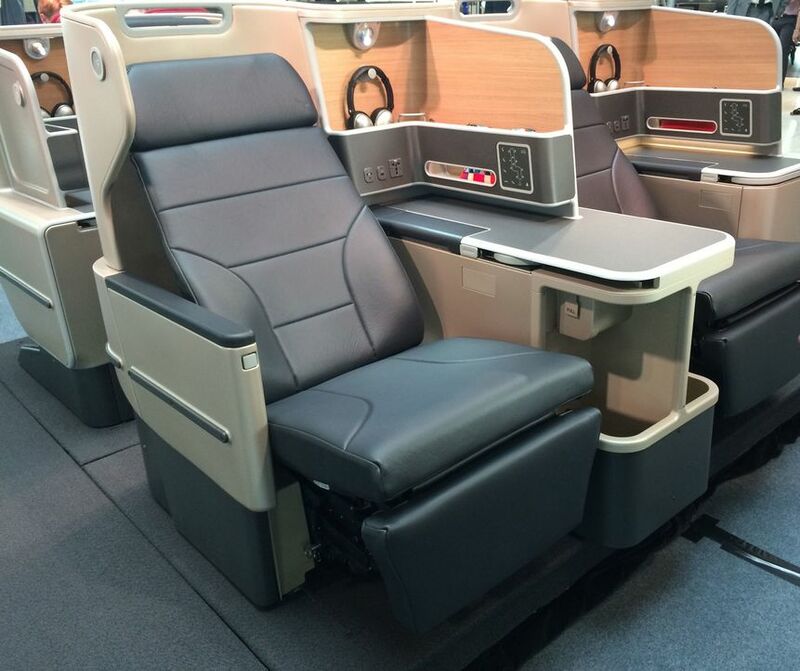 The international -300s will have the all new economy product with the new seats and larger screens. I'm keen see how that turns out (since sadly it's where I'll be spending most of my flying time!). Is there only the one toilet for business class? Yep, but two on the international (A330-300) version. Just a small edit: there's no such thing as a South Australian Heathcote Shiraz. Victorian,yes; SA, no. You're absolutely right - my mistake, will fix that in the article and change my shopping list (as I intend to pick up a bottle of this for quaffing!). I'm using a 13 inch MacBook Air so I'd say 'yes' to the 15 inch MacBook Pro. Thank god for that could of been slightly problamatic otherwise. The seat looks great and finally brings QF back into the game with the 330 fleet internationally. 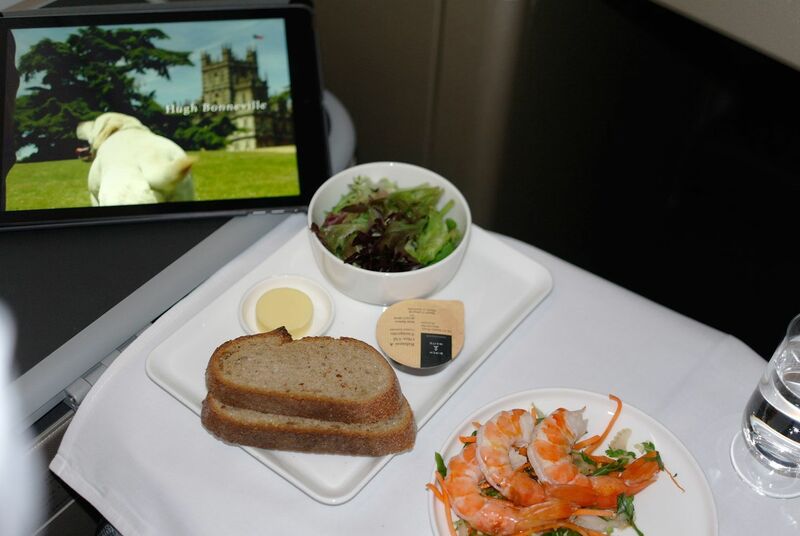 However As pictured catering continues to be a problem for QF and for this reason I don't believe the moniker 'worlds best domestic business class' as this is still clearly behind Virgin domestically. The removal of a toilet will also bring them a lot of trouble when trying to use the 332s internationally. 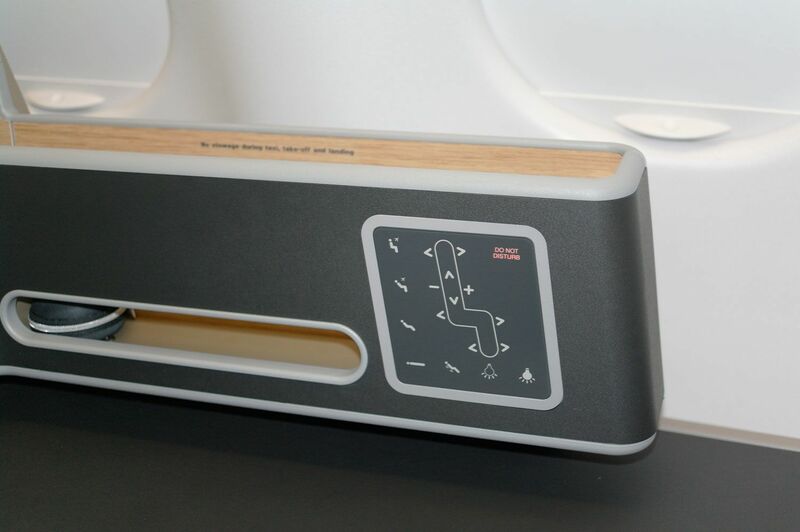 Hi Yohy: there'll be two loos on the international A333s but yep, any time the domestic is swapped onto an international route there will be a bit of a loo log-jam during peak times (especially before landing). 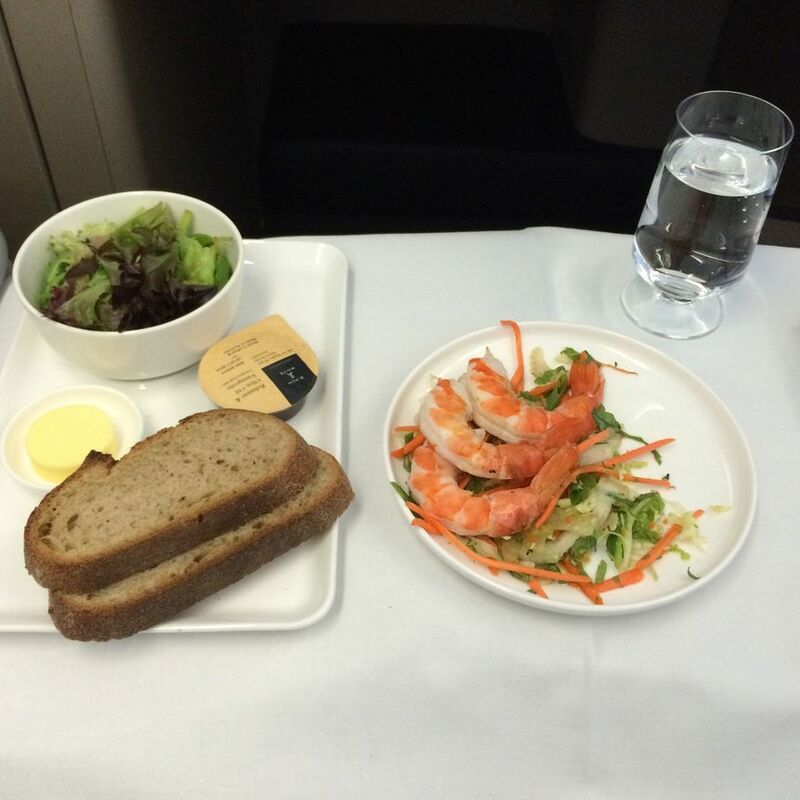 I wouldn't say catering is an issue for Qantas: the only issue I had was with the salad. The three courses were great. Virgin's SYD-PER meals are also great, but when I fly the seat/comfort trumps the meal, so unless there is a massive delta between QF and VA for inflight meals, I'd rather have the better seat on offer... one thing's for sure, we're looking forward to a 'head to head' comparo between the Qantas and Virgin transcon travel experiences later this year, when both are flying their latest seats (and in 2H15 when both have their new lounges open). Okay, I'll put my hand up and say that I am a VA fan and don't like QF, and have considered that the VA A330 Business Class was the best domestic I've experienced. However, I really want to try this! hi david - having been impressed by your previous reviews, i signed up for the ABT newsletter...and this latest review blows me away all over again. as a travel writer (who also teaches travel writing at uni here in oz) and long-time journo, i appreciate not only the detail but the way you write and illustrate your points. first class (even if not a QF first class!). talking of which, i'm flying BNE-HKG in qantas business next april, but seat guru still shows what i presume is the older A330 configuration. 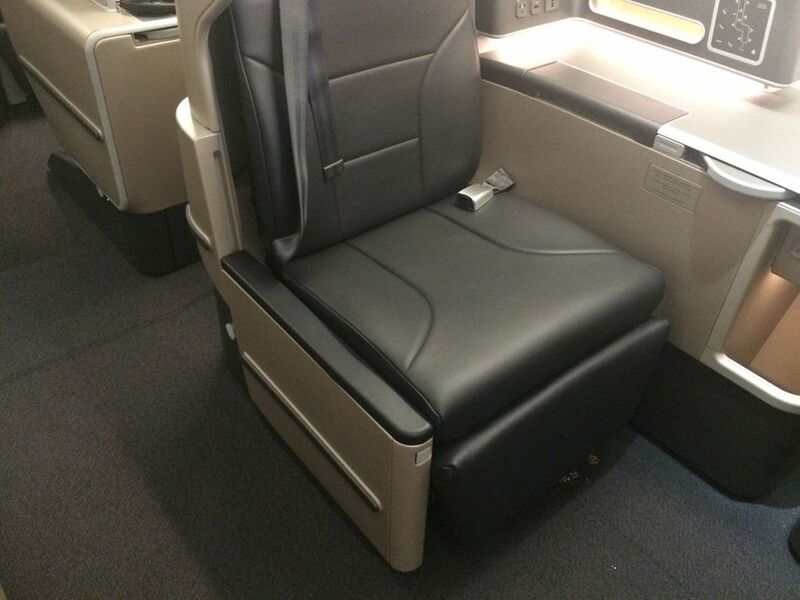 do you know if qantas will offer this new configuration since it no longer provides first-class on the HKG route (and nor does cathay)? thanks, david. keep up the good work. Thanks for the kind words. No idea about roll-out of the Business Suite to HK - if we had any news we'd share it here, to be sure! I'm disappointed to hear that the armrests don't go down on all of the seats. As I recall, this is possible on the earlier version of this seat flown by Swiss, so it seems the feature has been "enhanced" away. Any update on when these seats will be available internationally? Interesting review, but it's still the QANTAS corporate culture and "customer service", isn't it? Have been waiting for this review, everything explained so well, sounds really good..yes I to am interested to hear when it will roll out from Brisbane to Hong Kong, but sadly we are going to miss out as we leave first week of March... Love all your reviews, keep on keeping us informed, cheers..!! 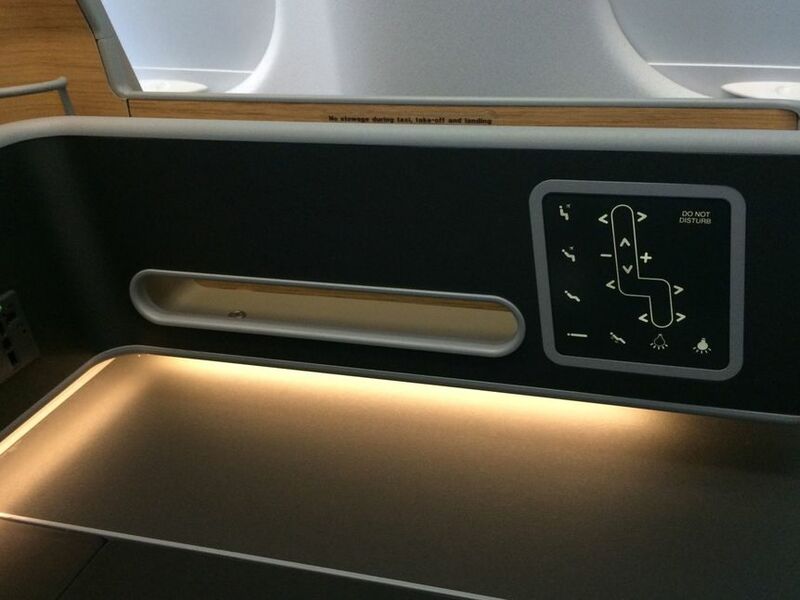 This reminds me a lot of the new First Class on AA's A321Ts they have running from JFK to SFO/LAX. I haven't flown in business on these yet, but suspect they would be the only likely competitor for the domestic business crown. 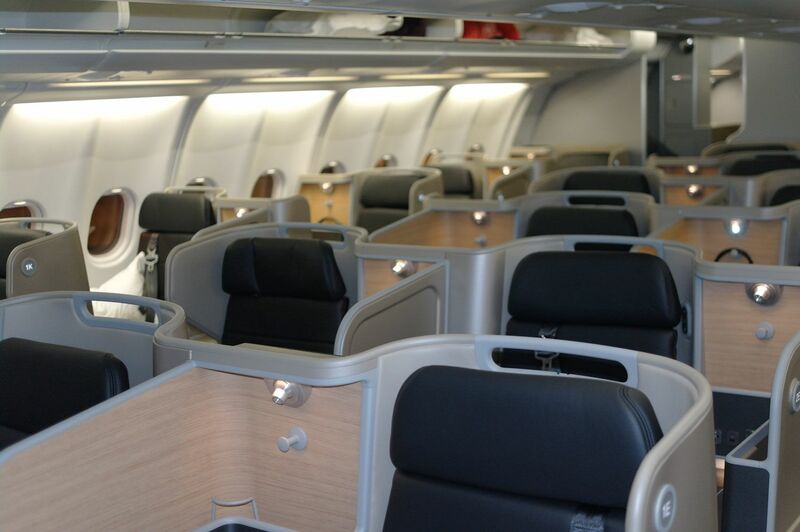 The old BMI A321 business class is exceptional (although not domestic, still considered "Club Europe"). Had that LHR-TLV once or twice - the most generous seat in BA's fleet, with tables on both sides of 1A. Thanks for a very comprehensive review. When in lie flat position, are you very close to the floor? If this a development from the Swiss business class seat it could be the case. Not a big issue, but in my experience somewhat akward having your head at the height of the flight attendants shoes. In lie flat you are approximately 510mm from the floor. any idea of international rollout and which routes first? Good question. I've just returned from HKG on the A380 business class and it reminded me, not having used it for some time, that if you want any position between lie-flat and sit-up, the seats are extremely uncomfortable and impossible to get a decent night's sleep. It seems impossible to stop the leg rest from assaulting your calves and the seat controls are not intuitive and generally unsatisfactory. One of the range of reasons I usually fly Cathay. ( an otherwise minor inner-ear problem means I can't sleep completely flat). 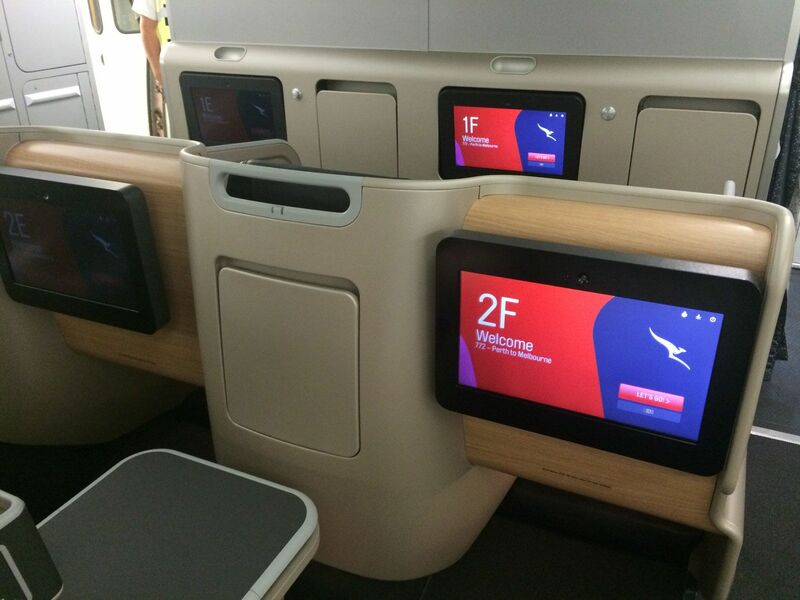 Melbourne-SIngapore will be first, and that's soon (and no, don't have a date I can share) - expect other Singapore routes to follow - see http://www.ausbt.com.au/qantas-plans-rapid-roll-out-for-a330-business-suite for more. It's very nice that, for once, Melbourne is getting something before Sydney (Qantas tend to be a bit Mascot focussed). 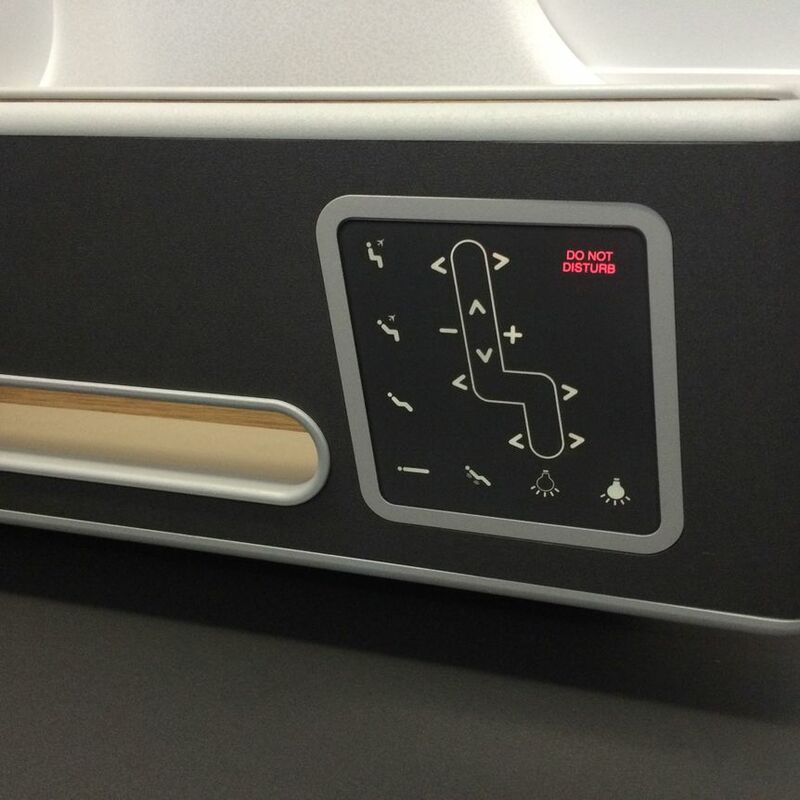 The first International launch of new Business seating - and really an International sector is the best one to try them out on (we even benefit from an extra Business toliet over the domestic config). Good review David, and this new fit-out looks great, but seriously how do they justify a $3800-$4000 return ticket Melb - Perth ( both VA and QF )? Amazing and detailed review David. I was wondering if anyone knew how to know if they are going to get a refurbished aircraft. I know to check the aircraft registration but is there any way to know what registration aircraft you will get? Great review and exciting product. 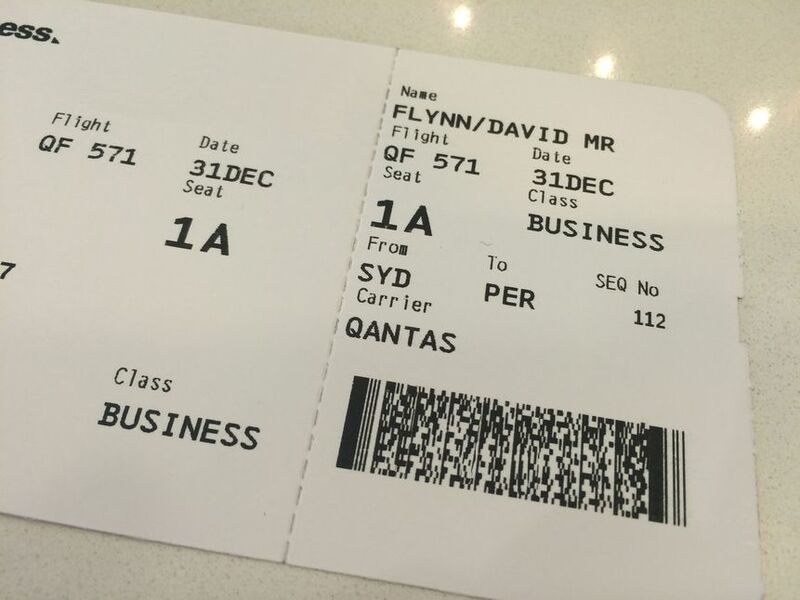 I am booked this week Syd-Per on A330-200, anyone know what chance I have of getting an upgraded plane, if any? Will put in for points upgrade from economy but not to keen on spending points on an old girl. Cheers! At a tangent I know ! Just flew Bris - Lax (Qantas) Lax - Ft Laud (Virgin America) Qantas couldn't send my bags all the way, I had to recheck at LAX. On the return flight Virgin America said it was no problem for them to book (by then, even more bags !) straight thru to Brisbane. Is it just me or does Qantas seem to be lacking in certain areas of service ? Economy Class in person is awful looking. Is there any way of knowing if either Perth to MELBOURNE or melbourne to Perth a330-200 flights will feature the new business suite? I would love to know if they also replace their current A333 on their BNE-PER route with the new ones. In October I will visit Australia for the first time and will have a feeder flight on that route (QF597 continuing to DOH and FRA on Qatar Airways' 777 and A350). Is there any way to find out? My current seat reservations for October still show a 2-2-2 layout which I would derive the old seats from. The one problem I see ore and more of is airlines going back to having the screen in the seatback rather than on a flexible stalk. This might work fine for those with 20/20 but for we older folks with poorer eyesight these screens are a long long way away. At least QF will apparenly allow me to stream on to my phone. Does anyone know of a SYD/MEL flight that will get one of these so I can give it a try? Have no need to get to Perth in the near future. Does anyone has access to the rollout plan of the new J cabin? Until when all of the A330-200 will be refurbished? I am wondering if the seatmaps they currently show during the reservation process for October are fix. That means if they stick to the layout they are showing there. Great review, thank you David. 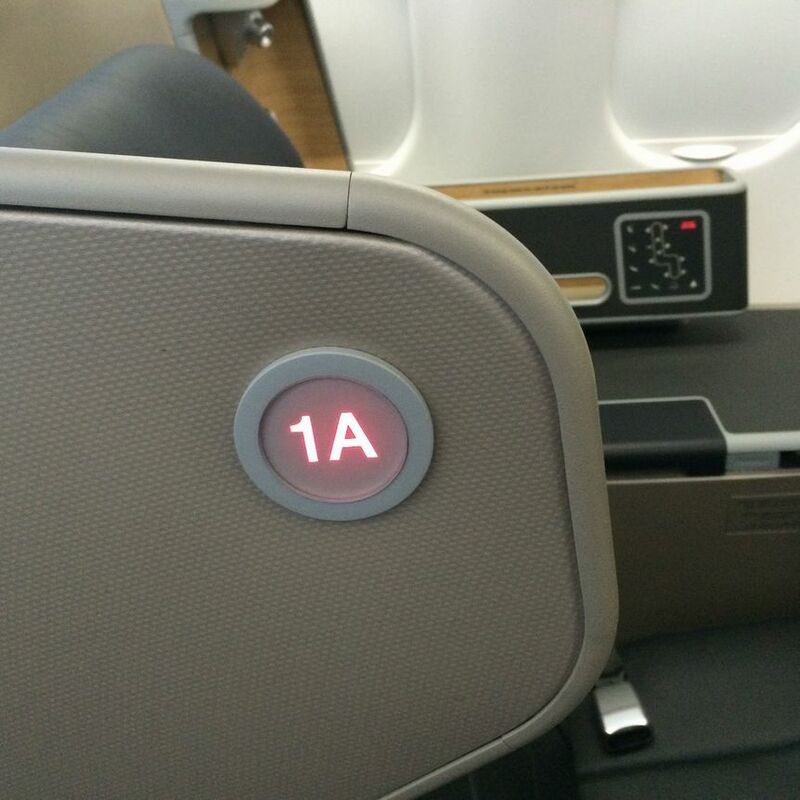 I have flown in the new seats 4 times and your review was helpful whilst I was navigating around the suite also helped me with seat selection. I absolutely love these seats! I only wish Qantas were more consistent with their service. it is so hit and miss depending on the particular flight crew. They need to scrap the old seating config straight away for the Perth to Brisbane flights. Nearly 6 hours sitting bolt upright (I was is 1A and didn't want to disturb the passenger behind as I have experienced the lack of leg room on these older seats) very disappointing as when I selected my seat, the seat plan was the new suite. 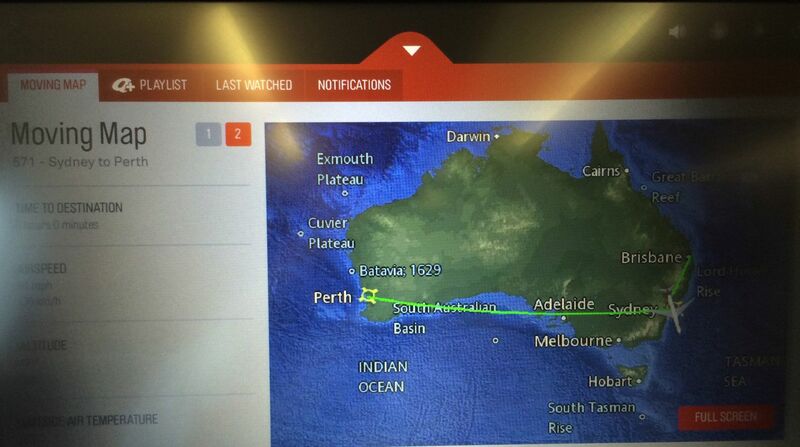 Qantas must have had a late change in the aircraft. 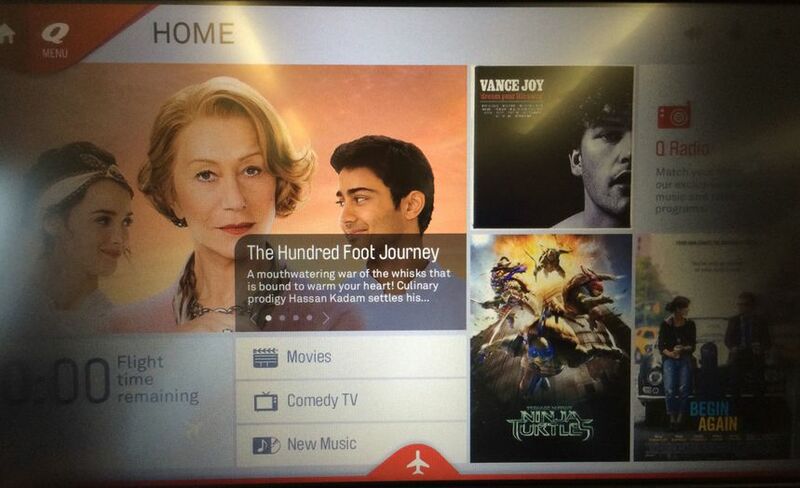 That plus mediocre service, faulty entertainment system, made for an average flight. Complete opposite to the flight over to Brisbane. All first world problems, I know. However, considering the cost of a j seat these days. The flying Kangaroo should listen to their passengers. 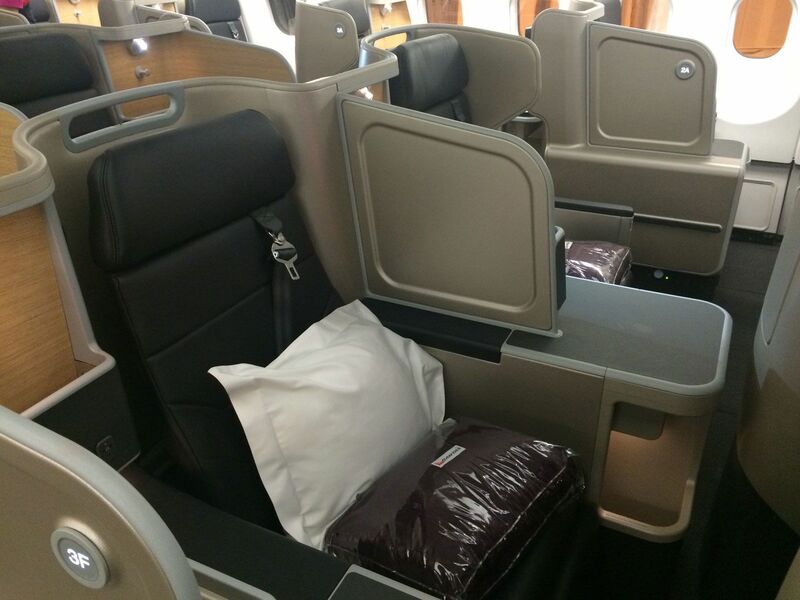 Any word on if/when QF will upgrade business class seats on the 747 or A380? Hi emailboy, we have nothing to share in that regard - when we have news to report, we'll report it. Great review David! Got 9.5 hour flight coming up on Wednesday. Looking forward to having a descent stint using this product. Probably worth mentioning to those posters previous asking the question as to what are the chances that their booking will be operated by an aircraft with this config. My booking was made sometime ago and the outbound SYD flight was originally being operated by an aircraft with a 2x2x2 abreast config, however just today, 48 hours out, it changed to 1x2x1 (28J). My seat selection was retained which gave me an odd numbered row window seat. QF, as with any airline can change inventory at any time up until you see your aircraft at dispatch, and the longer your booking is into 2016 the better the chance it is. I remember doing this dance circa mid 2000's with the Skybed. As it may have been mentioned before, if you have a booking that you can manage, go to the seat selection option (if available) and have a look at the abreast configuration, if it matches (somewhat loosely) David's seat map in his article - you're cooking with kerosine. 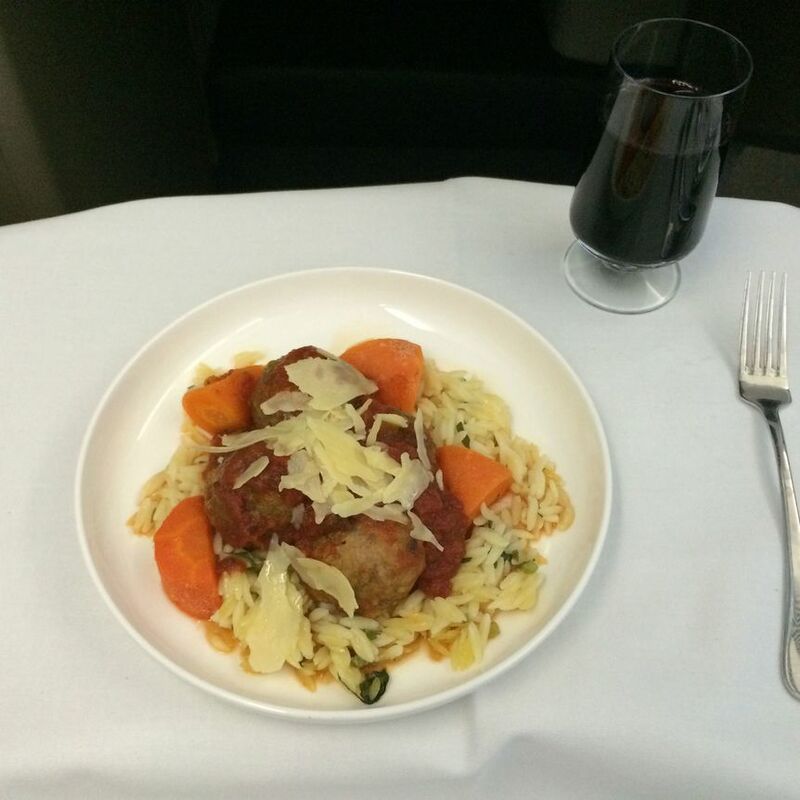 Anyone know what meal is served on QF642 PER SYD @0945 in J Class? 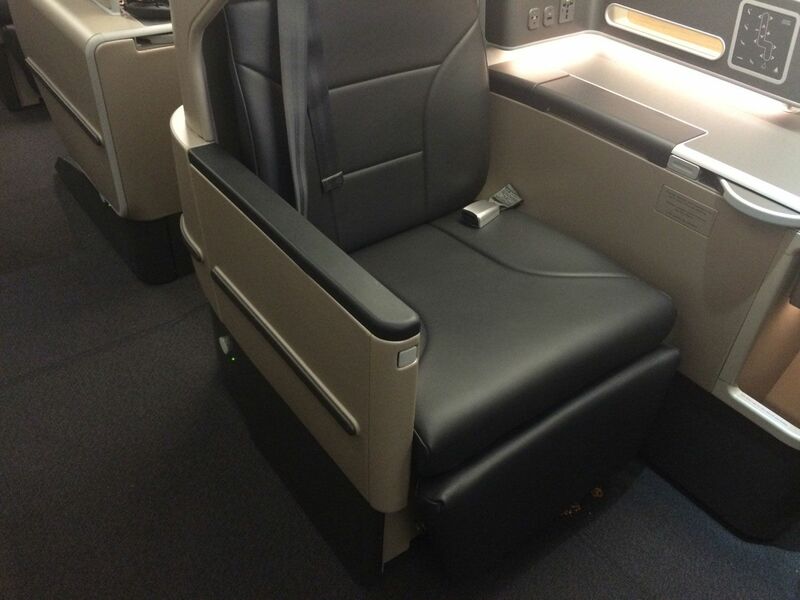 Comment on "Qantas Business Suite business class (Airbus A330-200)"
Already have an AusBT account? Log in below. Signing up with Australian Business Traveller only takes a second and lets you interact with our community. It's completely free and we'll never pass your information on to third parties. Didn’t receive an activation email? Resend one to yourself here. If you’ve forgotten your password, simply enter your email address below, then click 'Submit'. We’ll send you an email to re-activate your account and enter a new password. If you have not received the activation email, simply enter your email address below, then click 'Submit'. We’ll send you an email containing the activation link.